As I've said before on these pages, I love stoner rock. That vibrating buzz and those heavy grooves are intoxicating and, well, like other things, it makes me just want more. The only problem with too much of stoner rock is that it all sounds the same. There's not a lot of room in the stoner genre to make one band sound that much different than another. It's not a big problem because most of it still rocks but it does get a little tiresome sometimes. Then along comes Empire State Troopers and their "Upstate Again" CD and sets everything on its ear. This is an album that's different enough that, at times, I was wondering if I should really consider it a stoner CD. First and foremost, you have to mention the vocals. This is a stoner band with a female vocalist, already setting them apart from the rest of the pack. Her name is Kelly Murphy, and she's got a style all her own. Whereas others might be tempted to belt out songs like Veronica Freeman or Pat Benatar, Kelly's not afraid to take risks with her style, keeping her voice sharp and shiny like a dagger. She's not going to knock you out with her voice, but she might just slit your throat. Strangely, the band I'm most reminded of as I listen to "Upstate Again" is the legendary Cirith Ungol. No, the music isn't anywhere near the same, but the pioneering style and the audacity and determination to be original are. That's no faint praise. Empire State Troopers: Kelly Murphy - vocals; Thom Hall - guitar; Nathan Pallace - drums; Jeff Fox - bass. 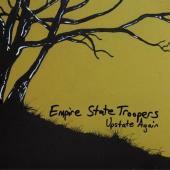 For more information, check out http://www.empirestatetroopers.com or http://www.myspace.com/empirestatetroopers.